A U-M cancer doctor explains a tumor board and how multiple experts help patients. Cancer patients tend to rely on their doctors for answers and treatment plans, but may not know how much is going on behind the scenes to help their cases. Hospitals hold regularly scheduled meetings–called tumor boards–to bring experts together to discuss difficult cases and recommend the best course of treatment moving forward. A tumor board is a multidisciplinary meeting where complex patient cases are discussed in significant detail. The meeting concentrates on patients with difficult tumors or patients who have previously received treatment and, for various reasons, now need a different treatment plan. All the disciplines are involved in this meeting. There may be a dozen experts or more in one room. Each patient’s diagnosis is introduced and the group reviews the patient’s scans with the goal to come up with the best treatment plan. “Tumor boards are great for patients because members of each specialty bring their own expertise to the table,” says Jorge Marrero, M.D., University of Michigan associate professor of Medicine and director of the U-M Comprehensive Cancer Center’s Liver Tumor Clinic. “They each have a unique view of the best approach to treat and care for a patient. It is great to have different perspectives according to the different specialties. We all compliment each other, share knowledge and offer recommendations as far as the best strategy for the patient. After the meeting, the patient receives a recommendation on how his or her treatment should progress. The U-M Cancer Center has such a wealth of expertise that it basically has a separate tumor board for every type of tumor. This is in contrast to community hospitals where all cancer cases are typically discussed at one single tumor board. List of the Cancer Center’s other tumor boards. Aracelli Martinez (left) works with Social Service Technician Sarita Castro in the Practical Assistance Center. Michigan was in the midst of its second economic downturn when Aracelli Martinez fell ill, recalling a terrible headache and itching all over her body. An area hospital referred her to the U-M Emergency Department, which led her to the Comprehensive Cancer Center. She received a diagnosis of multiple myeloma, a cancer of the plasma cells in bone marrow that help our bodies fight infection. Aracelli signed on to participate in a clinical trial and responded well to treatment, despite the reality her disease could be aggressive and she might have as little as six months. During that period, Aracelli lost her job. Then, her husband Miguel lost his job, too, and the van that came with his employment. Over the next year, with Aracelli still in treatment, the couple lost their home. So, how did a couple without health insurance or employment in the midst of a recession pay for treatment? Patient Financial Counselor Sue Thornton sees many patients newly diagnosed with cancer who are stressed about bills they cannot pay. According to Social Worker Katie Schneider, LLBSW, from the Guest Assistance Program, medication costs and transportation are key areas of stress for many cancer patients. For these practical matters, the Cancer Center’s Practical Assistance Center offers a range of services, like helping patients get wigs and figuring out which national and local programs offer aid for various expenses. Learn more about Financial Services at the Cancer Center. Fourteen years after recovering from breast cancer, Carol Rugg was diagnosed with stage 2 cervical cancer. Rugg knew she’d fight again and her husband, Richard Montmorency, as her caregiver, would struggle through it, too. The FOCUS program encourages participants to make plans for the future. Montmorency (foreground) and Rugg plan to go overseas now that she is well. Helping cancer patients and their family caregivers cope with the disease has been the focus of University of Michigan research led by Laurel Northouse, Ph.D., R.N., and former co-director of the Socio-behavioral Program at the Comprehensive Cancer Center. An estimated 4.6 million Americans provide care to patients with cancer. Northhouse’s research was used to develop an Ann Arbor-based support group, the FOCUS Program, for cancer patients and caregivers. The support group is run by the Cancer Support Community. 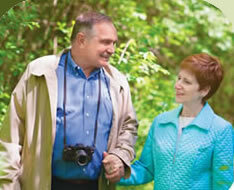 Learn about support groups and programs at the Cancer Support Community of Ann Arbor. See more caregiver support groups. Suggestions and tips for caregivers. On June 17, father figures will be celebrated and thanked for all they do. June is also the month designated to raise Men’s Cancer/Health Awareness and encourage early detection and treatment of disease among men and boys. Since it was passed by Congress in 1994, National Men’s Health Week. It is observed every year during the week of June that ends on Father’s Day. Besides raising men’s health awareness during June, this month also aims to encourage men to schedule regular health check-ups and seek early treatment for disease and injury. The cancers that most frequently affect men are prostate, colon, lung, and skin cancers. 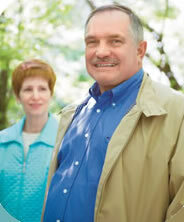 Knowing about these cancers and how they can be prevented or found early can save your life. The American Cancer Society suggests these actions to take control of your health and reduce your cancer risk. Eat healthy foods; including plenty of fruits and vegetables. Know yourself, your family history, and your health risks. Make a testicular exam part of a routine cancer-related checkup. Do you want to raise Men’s Health Awareness? Designate a “Wear Blue Day” to help spread the knowledge of Men’s Health Month. Choose any day that works for your group. Choose blue accessories, head-to-toe blue work attire, or blue prostate cancer pins to wear in support of the fight against prostate cancer. Throughout the year, the University of Michigan’s Comprehensive Cancer Center Community Outreach Program provides a “Men’s Fellowship Breakfast” and cancer screenings. Check periodically at the Community Outreach Event website to see when the next breakfast or free screening event is scheduled. If you would like to talk with someone about cancer prevention, please call the Cancer AnswerLine™ at 800-865-1125 and one of our cancer nurses will help.